I know I’ve been MIA for a couple of days! I’ve been so busy working at school and celebrating my birthday (Hip Hip HOORAY!). But I’m back now and taking a personal request from a friend. She wants to know how to make the most perfect and creamiest humus. Something good enough to serve to a real chef! Everyone who knows me, is aware that I generally volunteer to make humus for an event. It’s second nature to me. Something I’ve always made. It’s healthy, easy to make, and everyone loves it. I’ve always made it the same way that you probably do. Open a can of chickpeas (aka garbanzo beans) and toss them in the food processor with garlic, lemon juice, salt and of course tahini. Switch it on and watch as the mess of beans turns into a dip perfect for pita bread, tortillas and vegetables. This is a convenient way to make it. BUT let me ask you a question…. 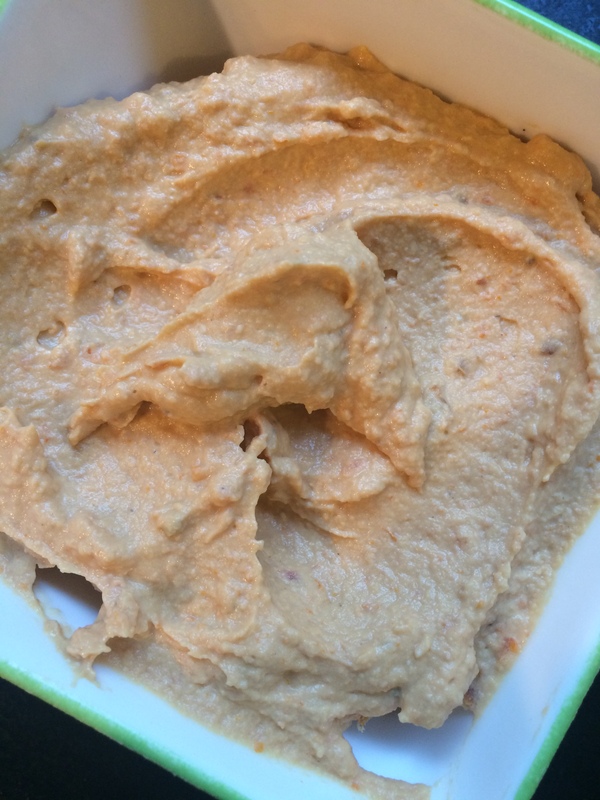 Did you ever feel that your humus is…. what’s the word… gritty? It’s not as silky smooth as your favorite restaurant is it? No matter how long you process the mixture it remains gritty. I’ve done a bit of researching and there is a secret to smooth humus. Have you ever noticed an opaque shell surrounding each bean? That’s your culprit! This shell prevents you from achieving that silky smooth texture that you desire. How do you easily shell chickpeas? You could do it my way and just peel each one at a time. It’ll take about 5 minutes but you’ll ensure that each one is peeled. Another way is to gently rub them in a towel to loosen the shells. Toss them in a bowl and run them under running water so the shells float to the top. Use a strainer to remove the shells. 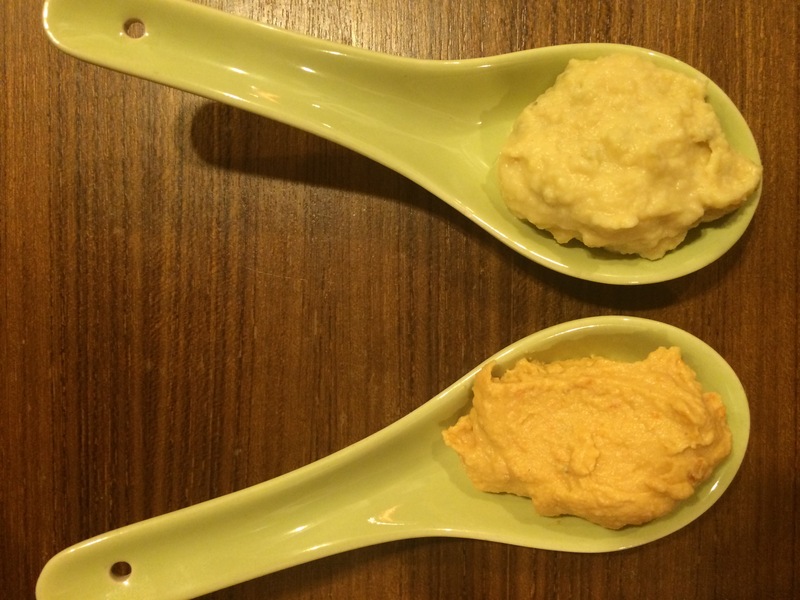 Today I made 2 kinds of humus to test out this theory that shells are the impetus of creamy humus. Add all of the ingredients to your food processor and process for at least 5 minutes. If the mixture is too thick, then add water 1 tablespoon at a time until smooth. Be careful not to add too much water or you’ll end up with a liquid mess. Yuck! For the sake of my experiment, I did not shell the chick peas for the jalapeno humus. The jalapeno will have liquid in it, but if the mixture is too thick, then add water 1 tablespoon at a time until smooth. Again, Be careful not to add too much water or you’ll end up with a liquid mess. Yuck! So alas, I’ve made 2 different kinds of humus. While both tasted amazing, the Jalapeno Humus had a unmistakable grittiness while the Sun Dried Tomato and Feta Humus was so creamy. No grittiness! It only took a lick of the bowl to realize the difference. Check out the picture to the left. You can see the lumpiness of the Jalapeno flavored compared to the Sun Dried Tomato Feta Cheese flavored. 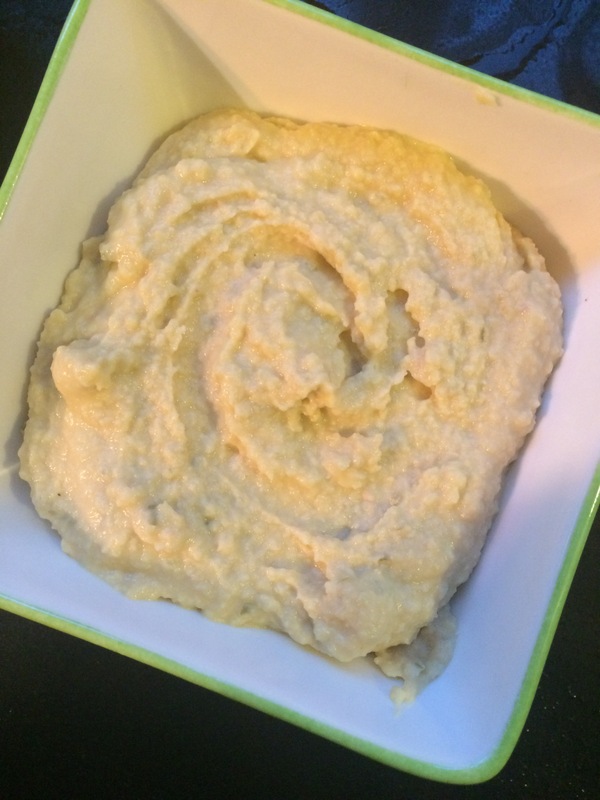 Next time you make humus, take the extra few minutes to shell each garbanzo bean! A simple yet useful idea! What flavor humus did you make? How did the texture turn out? Take the shell off. Makes sense, yet I never would have thought of it... thanks! !